With a seating capacity of more than 62,000, newly-built Tottenham Hotspur Stadium in north London is not only the biggest home grounds in the English Premier League, it’s also the most advanced. The stadium boasts an array of unique architectural features, requiring a highly-customized LED lighting system capable of adapting to the innovative structural environment. The Club chose Musco for its experience and proven ability to create the most innovative systems in the world. 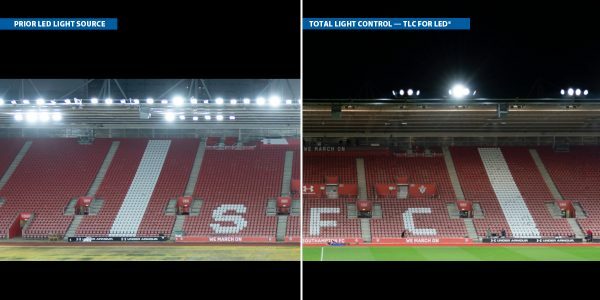 Tottenham gained a trusted partner and its industry-leading Total Light Control—TLC for LED® technology, designating Musco as the Club’s Official Stadium Field of Play Lighting Supplier. Virtually every aspect of the lighting was custom designed, including site-specific luminaires and mounting bracketry and remote electronics in dedicated electrical rooms for easy access. Tottenham won’t have to pay for any maintenance well into the future thanks to Musco’s long-term warranty covering every part and all labor, as well as guaranteeing light levels for the life of the system.